By James H, August 3, 2018 in Tools, Books & Misc. Some product names just roll off the tongue, and some don’t. This one definitely falls into the latter category, being called a ‘Stepless Adjustment Circular Cutter Locator’. For the purpose of this article, I’ll just refer to it as a ‘Locator’. This is designed to be used DSPIAE’s equally tong-twisting product, the Stepless Adjustment Circular Cutter, reviewed here. Like the other products that we’ve seen from this Chinese manufacturer, this is also packaged into an almost bomb-proof box that is constructed from MDF and then decorated for their unique and eye-catching brand that looks like something from a lost civilisation from South America! The back of the box has some rudimentary instructions and a description of what this tool actually does. In short, I’ll describe roughly what this accessory will do in conjunction with the circle cutter. I see this tool as having a number of similar functions. The most basic is to roughly locate the cutter on your masking film or masking tape media, allowing the modeller to maximise that material and reduce waste. However, there is a more significant reason for using this and that is to create concentric discs of masking material, allowing the modeller to create things such as roundels or masks for tank/aircraft wheel hubs etc. So, instead of just ripping away and making discs with the circle cutter, we now have a way to use it more completely as a tool and fulfilling its potential. Opening the box, we see a cardboard and foam cut-out into which the main components are sat, and on the opposite side, inner lid, we have a couple of instructional images. One of the components, a clear acrylic guide that sits into the L-shaped Locator, firstly sets the central position of the circle you will cut. There are grooves in this that, whilst not calibrated, help give the modeller the centre of the circle to be cut. You can of course measure that on the guide and perhaps mark it for future use. The acrylic guide is a perfect and exact match to the circle cutter, from its centre to the outside corner. 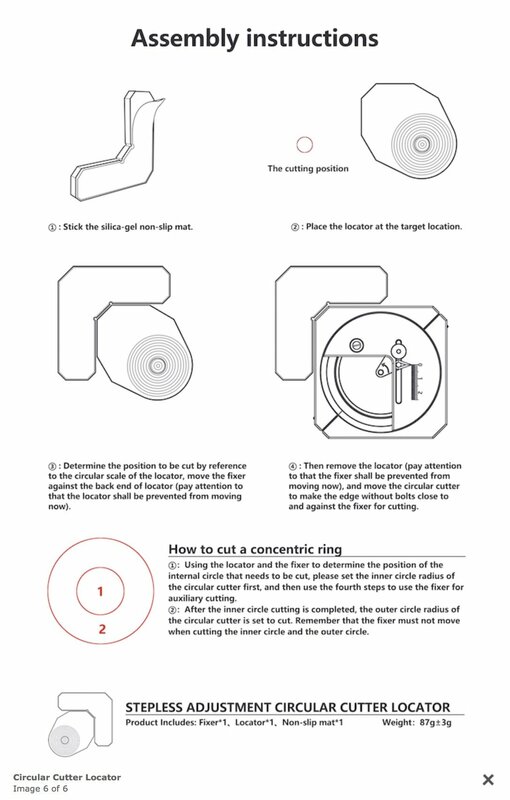 Once you remove the guide, you can then place the cutter into the Locator and start your work! As the Locator provides a perfect reference point, you can now set the circle cutter for larger and smaller circles, and they will all be perfectly concentric! The shape of the cutter allows this, unlike the circular Thinnerline product which would take more effort to produce the same work. The Locator itself is made from red anodised aluminium allow and is extremely robust. When you remove this from the box, you’ll note a self-adhesive rubber base which needs to be peeled and affixed to the Locator. Whilst I was extremely impressed with the circle cutter itself, this new addition really gives it a new lease of life and allows to me make roundels etc. on the fly, and thus for me to mask and paint more of my markings. A very high-quality tool that is relatively cheap to buy and increases your options if you have the cutter. If you don’t own the cutter, I really suggest you purchase one and add this extra tool to your shopping cart. Just amazing! 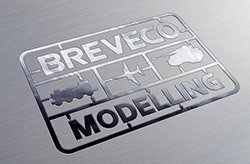 My sincere thanks to Breveco Modelling for sending this out for review on LSM. To purchase directly, click the link at the top of this article.